I have played a ton of games lately with International Table Top Day, Diceni and the monthly board game evening all happening on the same weekend. 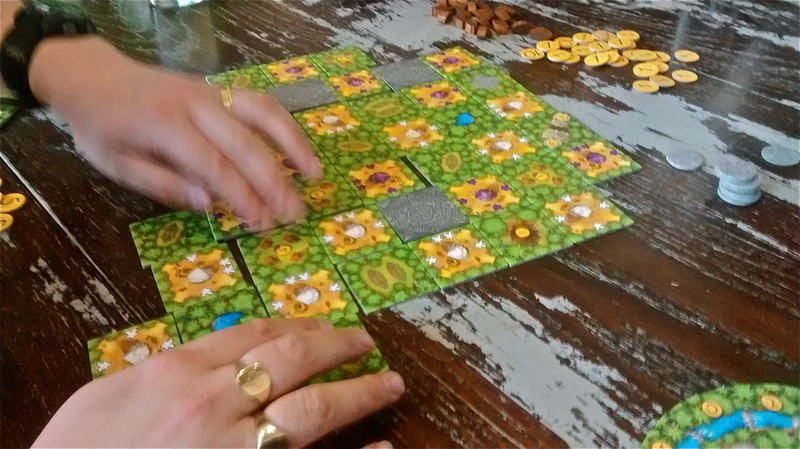 So when it came to NoBoG I was looking for something different to play, I had brought a few games with me but the one that people were interested in playing was Castles of Mad King Ludwig. While we were waiting for people to arrive I was introduced to a game I had never played before called Cacao, a game about harvesting Cocoa beans, finding water and praying to the gods with the winner being the one who ends up with the most money. We played it as a two player game and it really didn’t take that long to learn or as it turned out to play, I thought it was a pretty neat little game and I would definitely recommend giving it a go. 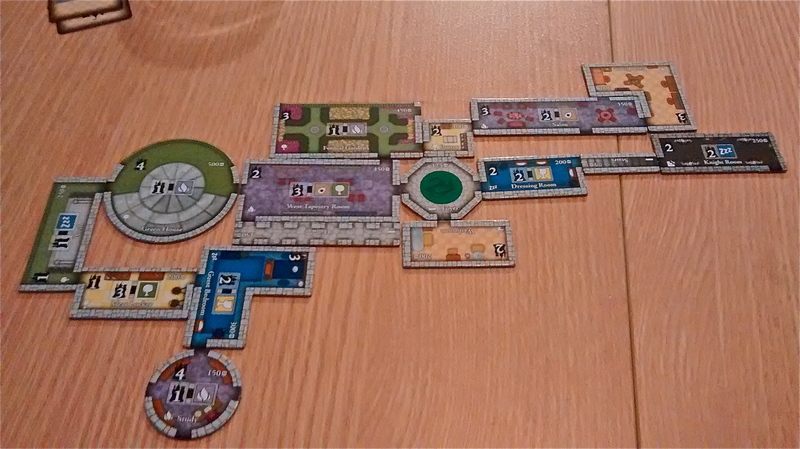 Castles of Mad King ludwig is a game that involves building castles in order to gain the favour of the mad king, players take turns setting prices as the master builder and everyone round sees the castles grow. There are public favours that everyone works towards and private ones and the winner is the one with the most points at the end of the game, In ours we had Andrew, Adam, Mel and myself. 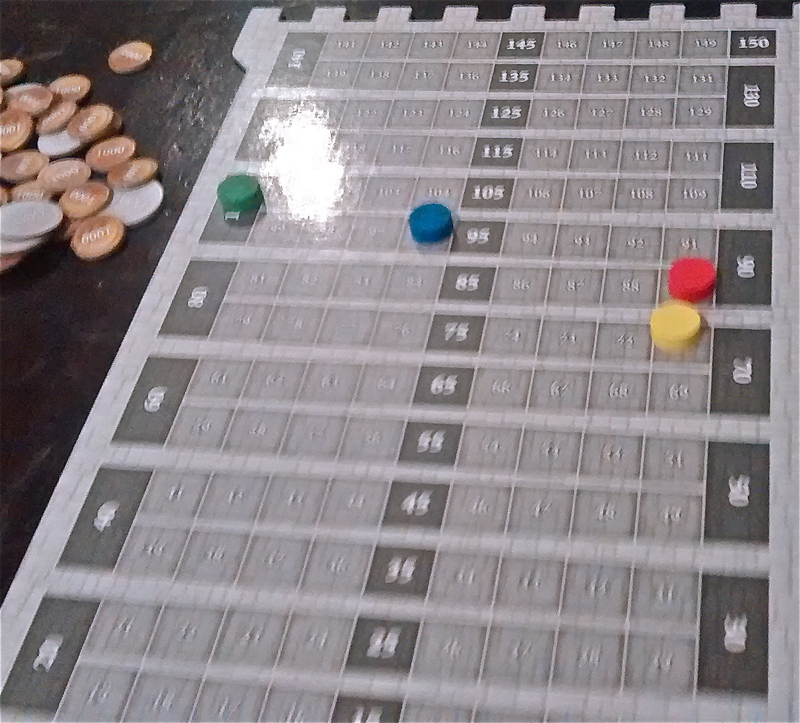 It had been a while since I last played it with new players and so my rules explanation might not have been the best but everyone seemed to be picking it up really well. In fact the were doing so well that I spent most of the game at the back of the pack. Everyone seemed to be going for different castles, Mel went with lots of living space, Andrew went for entertainment, I went for the favours and Adam, well Adam went for a bit of everything. As the game wore on I had managed to acquire quite a bit of money which let me utilise two very well placed food rooms which helped me catch up massively. The final rounds saw a mad ditch to get as many points as we possibly could, there was a lot to count up and when we did we found out that it was going to be an incredibly close game. 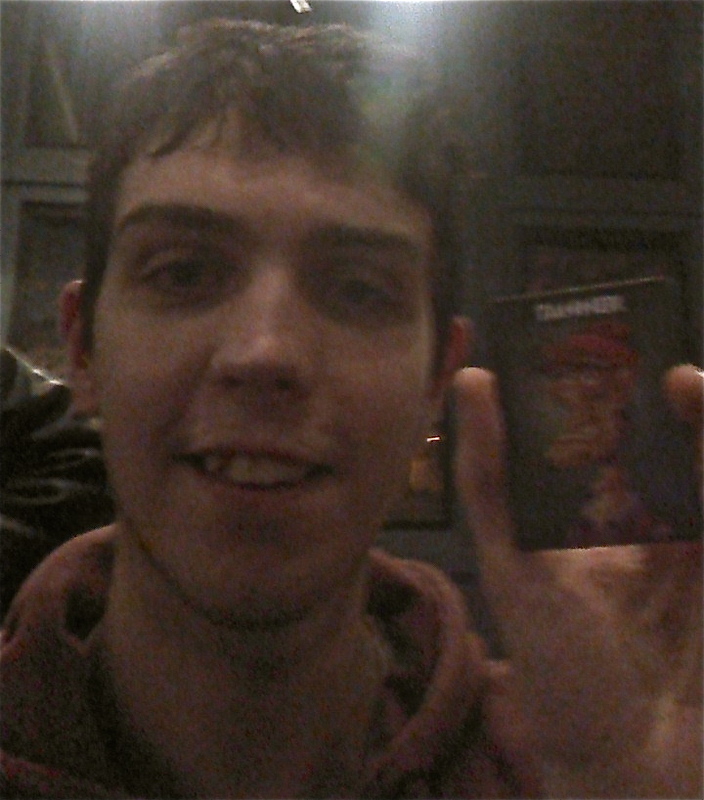 However once everything was said and done, Mel came Last, Adam came third, Andrew came second and I emerged victorious. Once it was all packed away I headed downstairs to see if there was anything else going on and luckily I came down just as they were about to start a game of One Night Ultimate Werewolf. I am a big fan of this game and have had some pretty epic wins, although I was playing with Lewis who knows that when it comes to this game I am usually the tanner, a character who wants to get lynched as that will win him the game. Lewis was sure I was the tanner before the first round even started and you know what he was right, I even came out as one when the night ended to much amusement. While the rest of us tried to work out who the werewolves were, Shaun started acting a bit shifty and managed to get himself lynched. This was unfortunate for us but great for Lewis and martin who won as the werewolves. Cue the second round and the addition of three more players which brought even more roles into the game such as the minion and the doppleganger. With all the extra roles and players I somehow emerged as the tanner for the second game in a row. This time I claimed to be a robber but one that I had been given after starting off as an insomniac, once I said my peace I left it out there and didn’t think that much of it. As the timer counted down, a sudden change occurred thanks to a player who had noticed my card but forgot my story just enough to make me look guilty. When the countdown finally reached zero, I had managed to get pretty much the entire table to vote for me. Not only was I the tanner twice in a row but I had just won in such an epic fashion, Lewis couldn’t believe what he was seeing and frankly i couldn’t believe it either. At this point i decided to go out on a high and head home a little bit earlier than usual, leaving the others to have another game without me and my tanner ways. Thank you to everyone I got to play with at NoBoG this week and I can’t wait to see you all next week. Next Next post: The Great Weekend of Gaming.